Aecero's team has extensive experience managing not only physical data center infrastructure, but also enterprise network and compute environments. Whether you just need someone to power cycle a server, or would like help architecting a hybrid cloud compute environment, we're here for you 24x7x365. With the support of our partners, we can help accomplish anything! 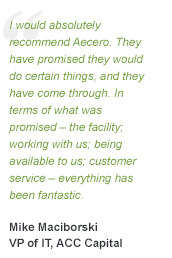 Most of all, we're proud our clients tell us our service is world class and second to none. Experience our service for yourself – contact us today!